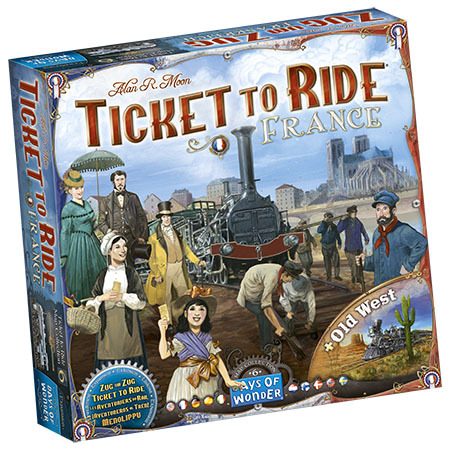 Find out Ticket to Ride Map Collection Volume 6 – France and Old West a new expansion in our well-known Ticket to Ride series. This expansion will challenge the players’ existing habits, as this time, before claiming a route, you will need to build the tracks and choose their colors. This simple variation adds a new twist to Ticket to Ride and makes the France map completely unique. The double-sided board also features a map of Old West, where up to six players can develop their railway networks starting from their Home Cities. Claiming routes along the way will make players face a dilemma: every time a player takes a route which leads to a city controlled by an opponent, that opponent scores the points. 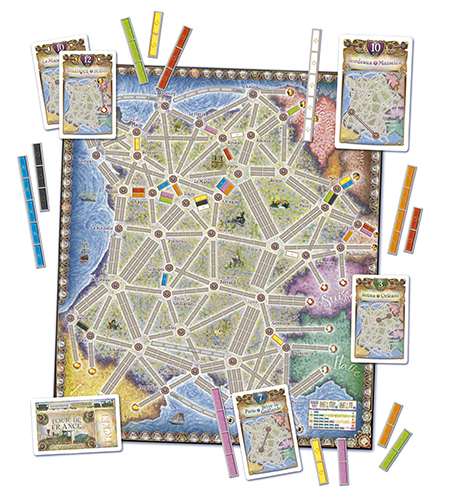 Ticket to Ride – France includes a oversized, double-sided map. The French map is designed for 2-5 players and includes 58 Destination Tickets cards, 2 Bonus cards, and 64 Track Pieces. 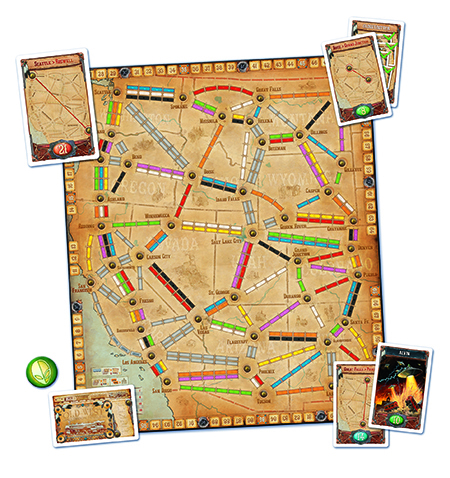 The Old West map is designed for 2-6 players and includes 50 Destination Tickets cards, 2 Bonus Cards, 40 White Train Cars, 18 City Markers, and 1 Alvin the Alien Marker. Both of these maps require the trains and the train car cards from either Ticket to Ride® or Ticket to Ride® Europe. This expansion is scheduled to be available at Essen and in Europe late October followed by a early November release in the USA, at a suggested retail price of €40-$44.99. This entry was posted on Tuesday, August 22nd, 2017 at 15:15 and is filed under Games, News, Ticket to Ride. You can follow any responses to this entry through the RSS 2.0 feed. Both comments and pings are currently closed. YES!! This is AWESOME! I cannot wait! I confess, I wasn’t sure another TTR map would intrigue me. Silly, silly me. This is Days of Wonder, so of course they can release another TTR map that I’ll want (perhaps need) to add to our collection. I’m really looking forward to adding this to my collection. Sounds like it should be lots of fun. @Tod – That was my thoughts also. A different colour would have been good (maybe orange or brown to match the board). Never the less very exciting! Why do you need a completely new colour? I can’t think of any good reason. The only reason the white trains are added is to give the sixth player a colour to play in addition to the five colours from one of the base sets. This is something I’ve been doing for a long time with USA and Nordic. White stands out from the existing colours which makes things easier for people with poor eyesight or colour blindness. Orange and brown would be poor choices for that reason.